Bijou Basin Ranch: Here Be Dragons....and Rewards! 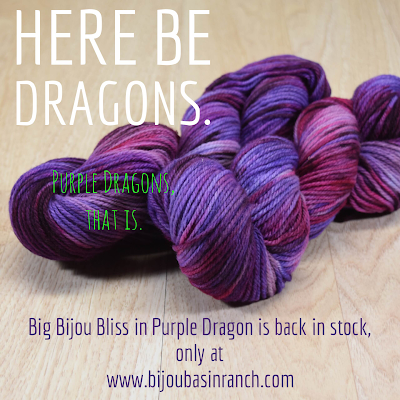 First, we have a restock alert: our Big Bijou Bliss in Purple Dragon flew off the shelves (pun intended) - but we found a way to source more! Get yours while supplies last here in our online store. If you're just now finding our blog, be sure to check out our previous post featuring these limited edition colorways which are dyed especially for us by MJ Yarns, found here. Have you ever wished you could get rewarded for buying yarn? If so, you're in luck! 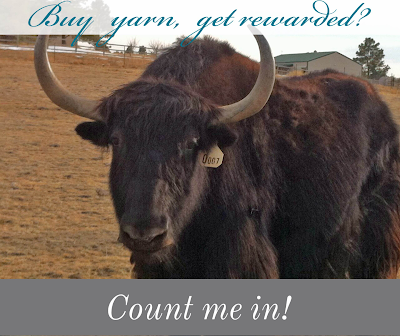 We've just unveiled the BBR Rewards program for our most loyal lovers of luxury yarn. If that last sentence describes you, then click here to join - it's FREE and you can start earning points right way! Each online purchase will earn you 5 points for every $1 spend, so they'll add up quickly and can be redeemed for valuable rewards. Click here to register for free at bijoubasinranch.com!